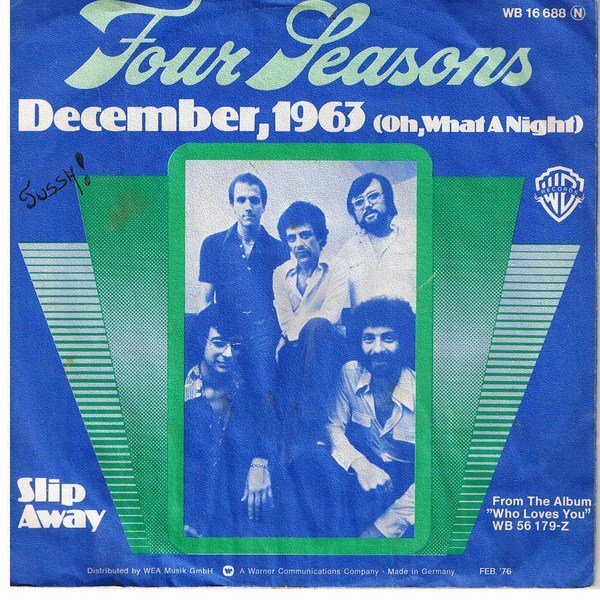 “December, 1963 (Oh, What a Night)” is a song by the Four Seasons, written by original Four Seasons keyboard player Bob Gaudio and his future wife Judy Parker, produced by Gaudio, and included on the group’s album, Who Loves You (1975). The song features drummer Gerry Polci on lead vocals, with the usual lead Frankie Valli singing the bridge sections and backing vocals, and bass player Don Ciccone (former lead singer of The Critters) singing the falsetto part (And I felt a rush like a rolling ball of thunder / Spinning my head around and taking my body under). Don Ciccone (February 28, 1946 – October 8, 2016) was an American singer, songwriter and musician. He was a founding member of the pop group The Critters. Later in his career he was a member of Frankie Valli and the Four Seasons (1973–81). He played guitar and bass and also contributed lead vocals to songs including “December 1963 (Oh, What a Night)” and “Rhapsody.” and Tommy James and the Shondells (as their bassist, through 1987). Ciccone was born in Jersey City, New Jersey. During his time with the Critters, he wrote “Mr. Dieingly Sad”, produced by Artie Ripp, which reached #17 for the group. He also wrote “There’s Got to be a Word” which was released by the Innocence in December 1966. This song reached #34 on the charts. After he quit the Critters, he joined the U.S. Air Force and served during the Vietnam War. Ciccone, who was a long time resident of Sun Valley, Idaho died in adjacent Ketchum, at the age of 70.